Stellar Phoenix Excel Recovery software is designed to recover and repair corrupted Microsoft Excel spreadsheet. This advanced spreadsheet repair program restores damaged excel files after instances of accidental format, virus attacks, unexpected system shutdown and even sabotage. The software supports all the latest version of Microsoft Excel including Excel 2000, XP (2002), 2003, 2007 and compatible with Windows NT/2000/XP/2003/Vista. ...... You should use Stellar Phoenix Excel Recovery Software when you find the error message like- unable to read file, Error EXCEL.EXE, File .xls can not be accessed, Document not saved, Not enough memory, File not found, .xls file format is not valid and so on. Stellar Phoenix Excel Recovery never deletes or modifies any of the original data and even heavily damaged Excel documents can be optimally repaired and restored. 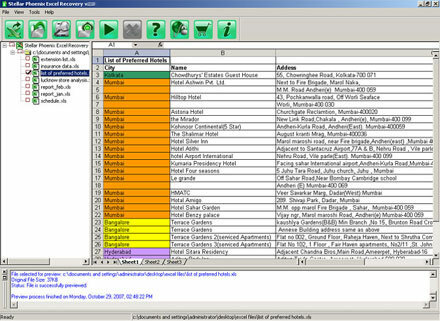 The format of the original spreadsheet (Name of the Sheets, Text strings, Integer and floating point numbers, Formulas in different format, Tables, Hyperlinks, Font color, size, style, font name and so on) is preserved at much extent. Qweas is providing links to Stellar Phoenix Excel Recovery 3.2 as a courtesy, and makes no representations regarding Stellar Phoenix Excel Recovery or any other applications or any information related thereto. Any questions, complaints or claims regarding this application Stellar Phoenix Excel Recovery 3.2 must be directed to the appropriate software vendor. You may click the publisher link of Stellar Phoenix Excel Recovery on the top of this page to get more details about the vendor.